Book Club "The Glass Castle" April 18th, 2019 at 6:30 PM. Location is 2614 Glenn Ave., Evansville, IN. 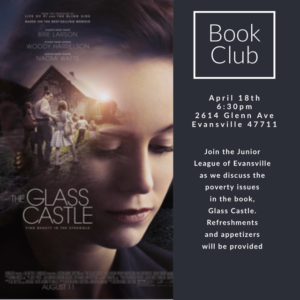 Join the Junior League of Evansville as we discuss the poverty issues in the book ‘Glass Castle.’ Refreshments and appetizers will be provided. Location will be 2614 Glenn Ave, Evansville, IN. Don’t worry if you haven’t read the book, as we will be discussing poverty in our community as well. Bring a friend along too!